Curious to learn more about Shell? Register for the various events lined up this year and take the opportunity to get to meet our people and learn about our culture. Join us for a day on Jurong Island and see how successful a women in Shell Engineering can be! Packed with insights to help you build on your career pathway, Shell invites you to a day of experiential learning with us! Take first-hand look at our Bukom refinery and explore behind the scenes of life as an engineer in Shell! Cut to shots of a lamp, the view from the top of a university student centre, and students registering. Cut to a shot of a female student getting her nametag sticker at another location. Cut to a close-up shot of one student writing his name on the sticker. Cut to another student registering at a seemingly different venue. Cut to a Shell representative confirming a pre-registered student’s attendance at the event. Cut to a shot of students engaging with a female campus ambassador dressed in red. Cut to a wider shot of students in broken down groups, each with a designated campus ambassador wearing the red ambassador shirt. Cut to another location, this time with a greater number of students gathered in round tables, each table with a designated campus ambassador. All ambassadors can be identified by the red shirt they are wearing. The scene closes up on a female campus ambassador, prior to the beginning of the event. 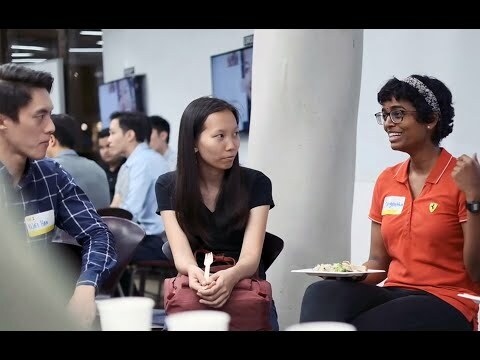 She says, “Going to work at Shell every day is quite exciting because you never know what is coming up next.” While she speaks, the camera captures her engaging with two students at a more intimate campus event. Cut to the Graduate recruiter and host presenting as students listen and pay close attention to him. Cut to a woman engaging with a table full of students. The music takes a deeper tone as the scene features more personal one-on-one interactions between campus ambassadors and students. Cut to Tracie speaking in front of a group of students, first shot is of her alone, the next shot is of the entire room. Cut to a student standing up, speaking during the event, engaging with the Graduate recruiter, who appears in the next scene. Cut to another event, the scene shows the Graduate recruiter speaking to the room of students. One male student states, “I feel that everybody who works here accepts diversity. Even though I am not very experienced in that sector, they (Shell) are giving us a lot of opportunities to shine.” Shots of students’ reactions during the engagement are shown. The students appear to be enjoying themselves, smiling throughout the dynamic group discussions. Cut to more shots of campus ambassadors sharing their own experiences in front of students. The scene zooms in on another female campus ambassador. “As a student, we go for so many different networking events,” she shares. Cut to a scene of the Graduate recruiter speaking in front of a room of students in a café-like room. Cut to another venue showing students in smaller groups, engaging with one campus ambassador per group. There is a photobooth wall in the background. Cut to two scenes of students speaking with campus ambassadors after enjoying some snacks. The camera zooms in on a male student attendee who says, “I am actually impressed that Shell managed to get a lot of Student Ambassadors down because I feel such actions can give a personal touch to graduating students like us in terms of them relating the future careers to us.” As he speaks, we catch glimpses of more students and ambassadors throughout the engagement. The music has sped up quite a bit at this point and one could feel it coming to an end. More interaction between students and ambassadors are shown, clearly demonstrating the comfort and trust between the two parties.